Forget the presents, the holidays, the decorated malls, the sales, the TV specials, the wishes, the cards, the sales, the Santa Clauses who look pissed they're not getting overtime, Christmas songs, the sales... did I mention the sales? Nevermind... forget it all. Even the sales. Happy birthday Jesus! You're the real reason for the season. I may not always act it, but I am thankful for all you've given me. I may just have to learn a little bit more on appreciating it all. But I am.. This may be one of my happiest Christmases yet. Why? Because I still have the love of my family and my friends. I also have my career, a future planned out, and so much more. I'll be back to blog more tomorrow. No matter what race or religion you are, do yourselves a favour and try and spend some time, or at least extend some attention to your loved ones. Be thankful for another day. 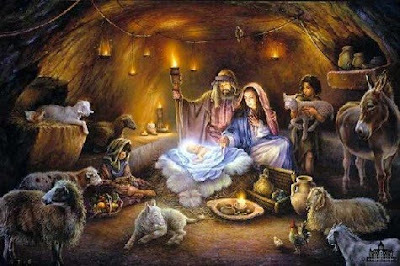 MARRY CHRISTMAS JOE N HAPY NEW YEAR........................!!!!!!!!!!!!!!!!!!! eja pon salah si songok nih! ahahaha... putraz, thanks a bunch,. happy holidays and happy new year!